Doctor Who can work very well as a comedy and The Fourth Wall is no exception. The show within a show, Laser, is an archetypal badly thought out space opera featuring villains with no real motives; in it Doctor Who can be seen to be not only poking fun at the worst excesses of the genre as a whole but also at the poorly plotted tales that mar its own canon.Â In the wrong hands such a self referential device might end up seeming far too clever by half, but The Fourth Wall pitches it just right, cleverly dealing with the subject of meta-fiction whilst its own fourth wall remains impregnable. The creation of a dimensionally transcendental bubble universe merely as a cheap way of recording a TV show might seem like using a thermonuclear warhead to swat a fly, but Scullop (Julian Wadham) gives the convincing impression of a man who doesnâ€™t really know â€“ or care â€“ what the technology is as long as it turns a profit at the end of the day.Â As such he is the only real (non fictional) villain of the piece – the Porcians would like to be seen as a threat but the ineptitude of this Hitch-hikers-esque race means that the most they can hope for is ending up as the comic relief. 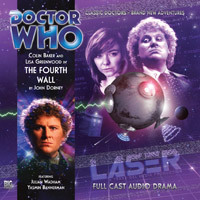 Despite the humorous tone of the play there are dark moments allowing Colin Bakerâ€™s Doctor to plunge the depths of despair and the temptation of vengeance.Â Lisa Greenwoodâ€™s Flip doesnâ€™t have as much to do as she did in her debut but still puts in a good performance, her taunting of fictional villain Lord Krarn early in the story providing one of its funnier self-aware moments. Fans of the classic series might recognise the DNA of both The Mind Robber and Nightmare of Eden here but The Fourth Wall is far more than just a comic re-tread of some of their concepts. It is a demonstration that when done properly, comedy and self-reference can give a definite boost to a long running franchise.